Click the "Add Calendar -> Add Public Calendar and Holidays" command on the File menu. Right-click in the Calendar List and select the "Add Calendar -> Add Public Calendars and Holidays" command. Click the "Configuration Wizard" command on the File menu, and advance to the step enabling public calendars to be added. There are a wide variety of publicly available iCalendar-formatted files available online. The Add Public Calendar feature enables you to quickly browse and add many popular public calendars to your calendar list. There are holiday calendars for many countries, calendars for the major religions, local weather, sports calendars (NFL, NHL, NBA, PGA, etc. ), and many others. If the calendar you're interested in is not listed, you can always either subscribe to it, or import it. Note: Most of the calendars listed in this window aren't created by VueSoft. We do not claim any copyright or intellectual property rights on these calendars. This window is simply provided as a tool for browsing and adding publicly available calendars that are created by non-affiliated 3rd parties. The calendar source and credit will always be listed for each calendar. If you've created an calendar and would like us to include it in this window, please let us know. 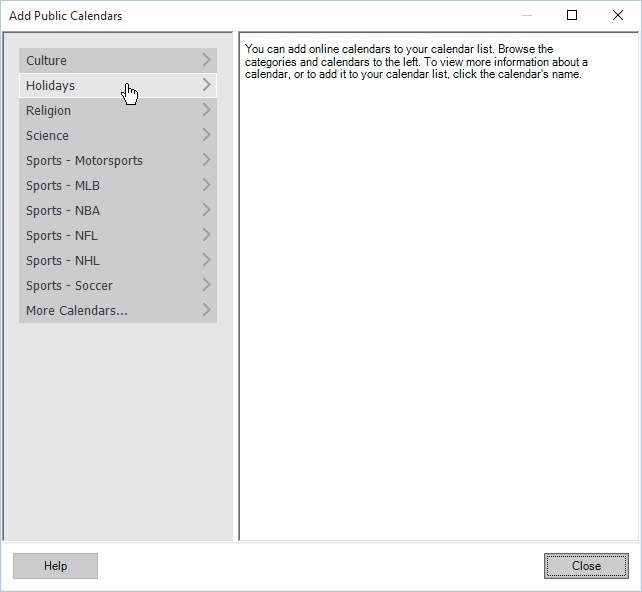 When the Add Public Calendars window is first displayed there may be a slight delay as the latest calendar list is downloaded. An Abort button is provided to cancel the download. 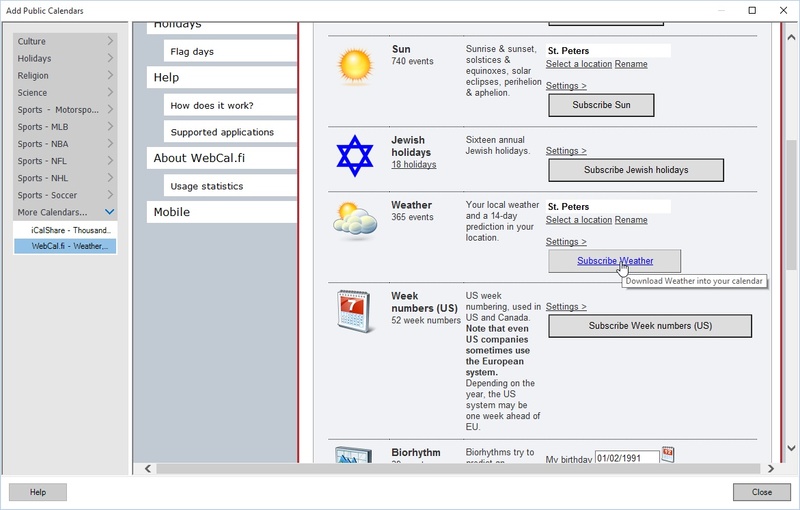 After the calendar list is successfully downloaded and processed, the window will appear as shown below. An expandable list of categories is displayed on the left side of the screen. Simply click a category and it will expand to show the available calendars associated with that category. To view more information about a calendar, click the calendar's name in the list. 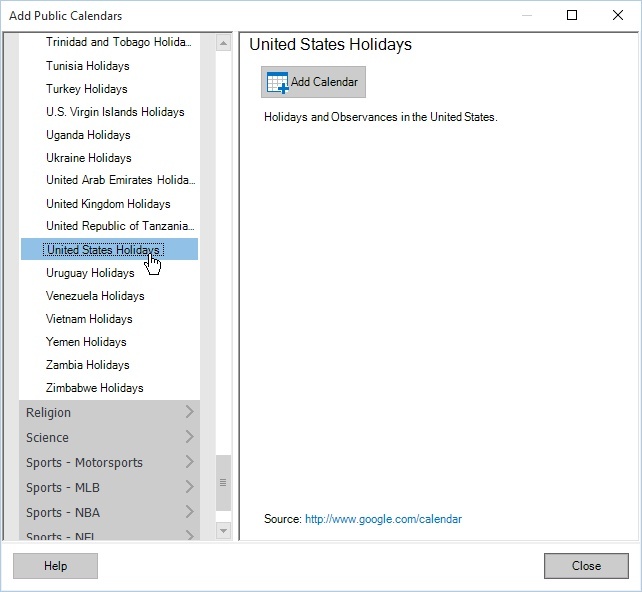 The window will update on the right to show the selected calendar's name, description, and online source or author. After you've found a calendar you'd like to add, click the "Add Calendar" button. The button will change and the calendar icon in the list will update to indicate the calendar has been added. Clicking the button again will remove the calendar. A new subscription will be created and the calendar will be added to your calendar list. The subscription will default to updating every week, which can be adjusted from the Calendar Properties window. You can continue adding as many calendars as you'd like. When finished, click the Close button to close the window. If you decide later that you don't want a calendar, you can delete it by using the Delete command on the main toolbar. A special "Webcals" category is available at the bottom of the list on the left side of the Add Public Calendars window. Items under this category will appear in a web browser, where hundreds of additional calendars can be browsed or added. Many of the available calendars are location-aware, such as local weather or sunrise/sunset times. Follow the steps below to add a local weather forecast to VueMinder. Similar steps can be used for adding other calendars. 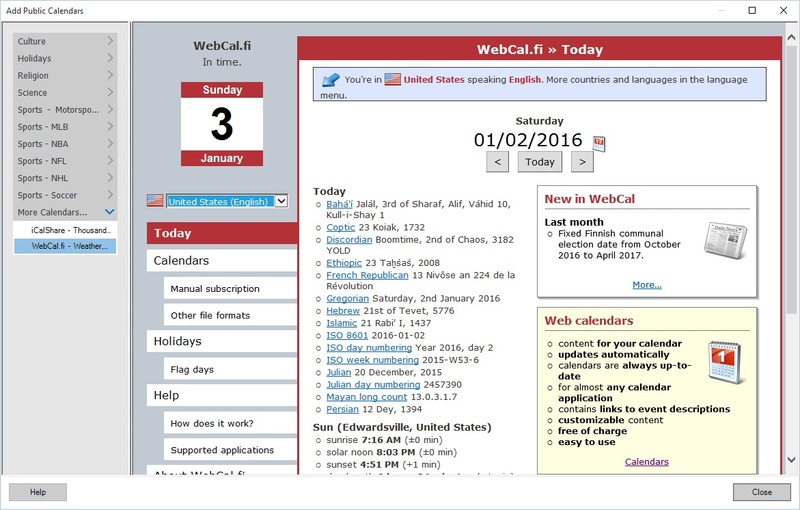 Expand the "Webcals" category on the left side of the Add Public Calendars window. Click "Webcal.fi". 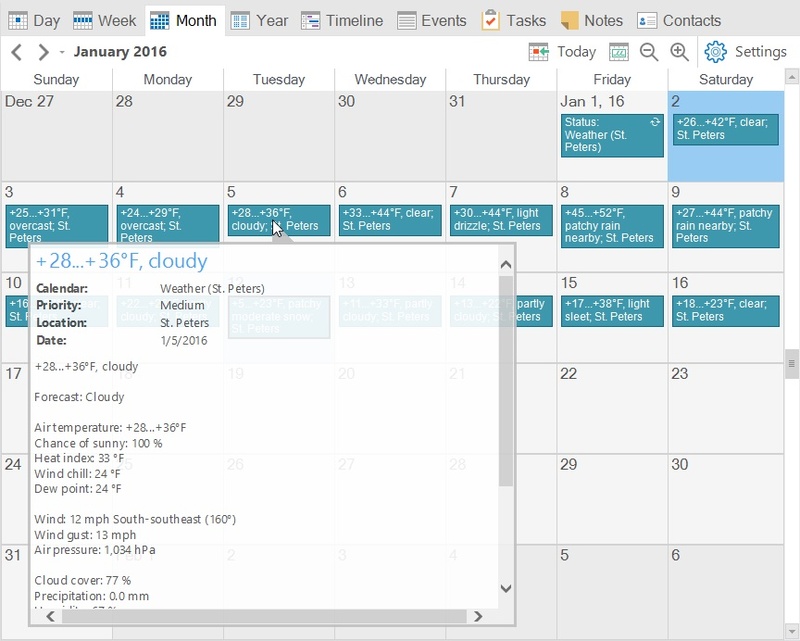 A web page will appear on the right side of the Add Public Calendar window. If the window is too small, click the maximize button in the upper-right corner. Click the "Calendars" link. You might need to scroll the page to see the Weather calendar. The web page should automatically detect your location. Since VueSoft is located in St. Louis, Missouri, the window appears as below. Your city should be automatically detected. Click the "Subscribe Weather" button. The calendar is a subscription and will update daily to show the weather forecast for the next 2 weeks. If you'd like to have the calendar update more frequently, the sync frequency can be specified on the Subscribe tab of the Calendar Properties window.